Usally I am not that sad when summer comes to its end, because I actually look forward to all the vegetables and fruits, that fall brings us. But since this summer wasn’t a real summer (seriously, it feels like this summer contained about 95% rainy days), I don’t want to let it go. I can’t believe the time has come when we put on our cosy socks and eat warming and hearty food instead of light salads with a cooling glass of white wine on the balcony. But when I look out of my window, I just see a grey and dark sky, so I had to admit to myself sadly that fall has come, even almost punctually on september 1th. But I still have hope september will bring us some late summery days though. 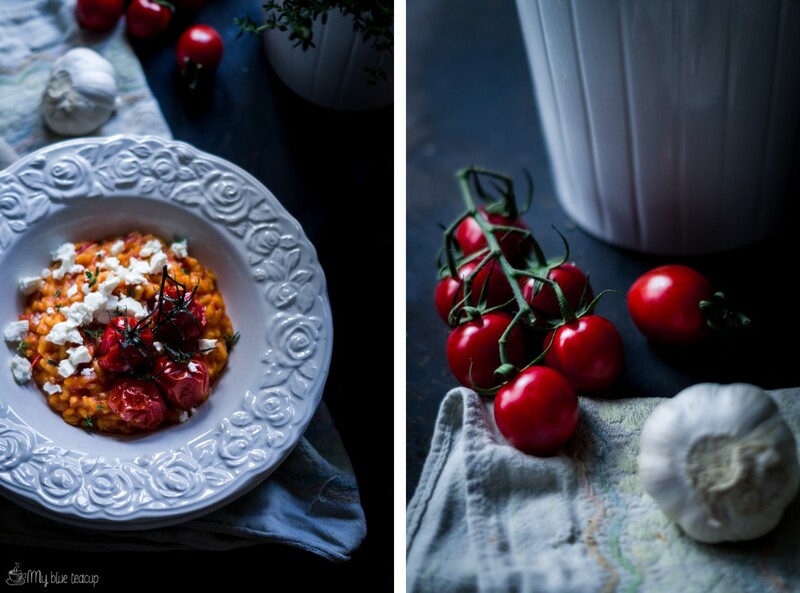 Until then I eat summer in form of tomatoes, which taste best in summer and develope their full sweetness and flavour by roasting, combined with risotto, what is for me one of the most comforting dishes (but precious at the same time). 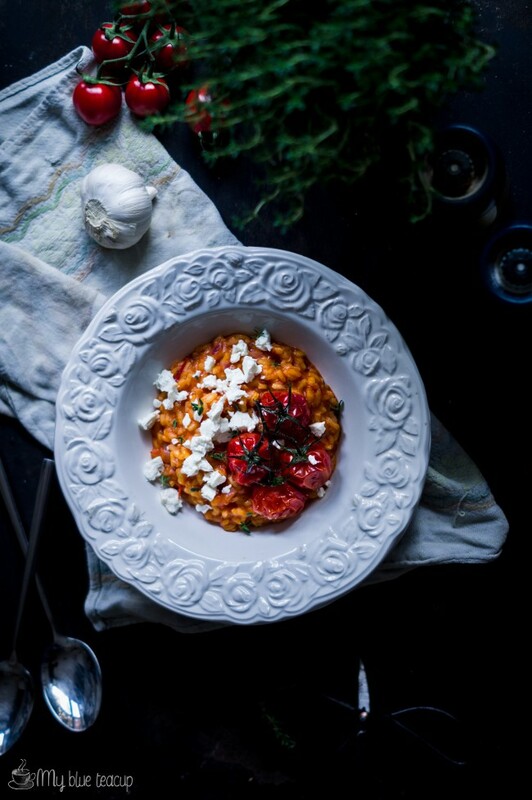 And fresh thyme and feta cheese (instead of parmesan) give this roasted tomato risotto a special twist. Preheat oven to 200° C (convection). Halve medium size tomatoes and remove stem. Place tomato halves, cherry tomatoes, garlic gloves and thyme stalks in a ovenproof dish. Sprinkle with salt, add about 6 tbsp. olive oil and toss until everything is coated with olive oil evenly. Roast for about 30-35 minutes in the oven. Remove dish and turn off the oven. Peel garlic and remove thyme leaves from stalks. Blend garlic, thyme leaves and tomato halves. Peel, dice shallots finely and sauté in 4 tbsp. olive oil over medium heat. Add rice and continue sautèing until rice is slightly glassy. Add white wine and cook until the white wine is almost absorbed while stirring continuously. Add 200 ml of the stock and cook until the white wine is almost absorbed while stirring continuously. Add the rest of the stock (200 ml at a time) and repeat procedure. As soon as the stock is almost absorb add tomato puree. Continue stirring, and when all the liquid is almost absorbed season with salt and pepper to taste and remove from heat. 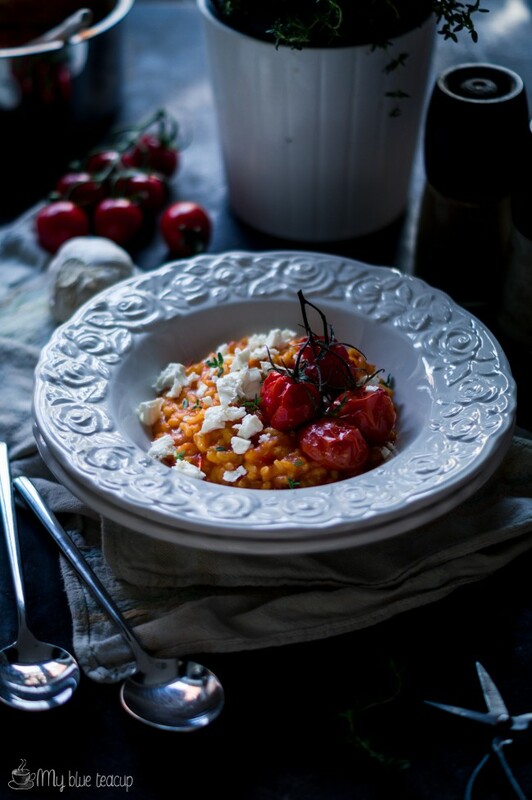 Place the risotto on plates or bowls, top with the roasted cherry tomatoes, crumbled feta cheese and fresh thyme leaves and serve immediately. I always find it exciting when a new season starts and suddenly you have all these new fresh ingredients that you haven’t used in almost a year. We’ve just entered spring here in Australia (so I’m secretly longing for summer) and I’m certainly keeping this recipe around for when I have copious amounts of tomatoes and have no idea what to do with them all! As usual, your photos are amazing! ? Wish you a lovely day!! !